The process to the dropping of the atomic bomb on Nagasaki is exhibited on a timeline and in pictures. 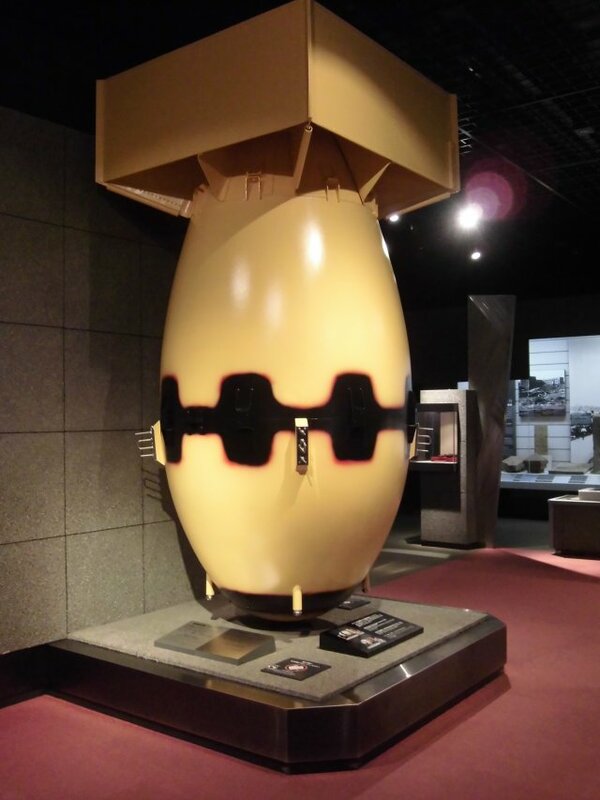 A replica of the Nagasaki atomic bomb, Fatman is also displayed. The second atomic bomb was dropped on Nagasaki on August 9th, 1945, three days after an atomic bomb was dropped on Hiroshima. The atomic bomb was assembled on Tinian Island and on the 8th, Field Order No. 17 was issued by the U.S Army in Guam Twentieth Air Force Headquarters to drop the second bomb on the 9th, the following day, on either Kokura as the primary target or Nagasaki as the secondary target. The Soviet Union declared war on Japan the same day. On August 9th, the B-29 bomber called "Bockscar" reached the sky over Kokura but the view was bad because of the smoke and haze caused by the air raid conducted in Yahata the previous day. Therefore, they abandoned the primary target and flew to the secondary target, Nagasaki, where they dropped the atomic bomb and it exploded at 11:02 am.